QUO VADIS, GREECE? (Where to, Greece?) – TRUTH IN MEDIA: TRUTH TRUMPS POWER EVERY TIME! TSIPRAS TO BETRAY GREEK VOTERS, STAB DEMOCRACY IN THE BACK? 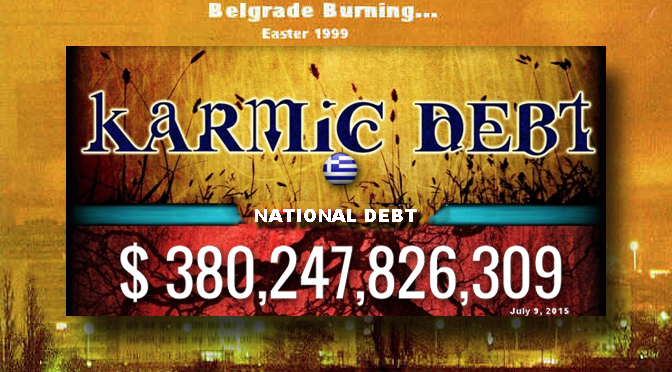 Also see… ARE GREEK KARMIC AND PUBLIC DEBTS INTERRELATED? So what is likely to happen after Sunday (July 12), the latest deadline the EU set for Greece to accept its ultimatums or leave the eurozone? Not very, in this writer’s opinion. At least not on Sunday, the D-day for the European Union and its bankers to make a decision about Greece’s staying or leaving. My money is on Tsipras (the Greek PM) caving in. He signaled as much a few days ago when he delivered the head of his flamboyant and outspoken finance minister, Yanis Varoufakis, to Angela Merkel and other European banking henchmen the day after the victorious (!) July 5 referendum. Lest we forget, it was Varoufakis (left) who captured the Greeks’ imagination and hearts when he said on the eve of the vote, that what the global and European bankers “what they’re doing with Greece has a name — terrorism. What Brussels and the ‘troika’ (ECB, IMF and EU) want today is for the yes (vote) to win so they could humiliate the Greek.” (see Financial Terrorism, July 5). Over 61% of his countrymen agreed and voted NO on Sunday, July 5, only to see their fiery finance minister unceremoniously dumped the next day by Tsipras, like some sort of excess baggage. To appease the bankers “troika” he had criticized (ECB, IMF and EU). 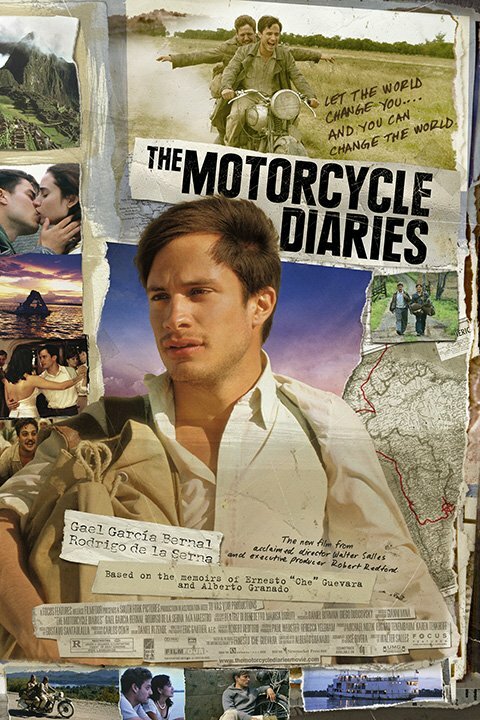 Stabbed in the back after delivering victory to Tsipras and his party, The Greek version of “Motorcycle Diaries” (a 2004 Che Guevara biopic). Almost immediately, Tsipras named Euclid Tsakalotos as the new finance minister. An Oxford-educated economist, Tsakalotos has much in common with the political elite of Westminster, having attended St Paul’s school, before going on to read politics, philosophy and economics (PPE) as an undergraduate. He later completed his PhD in economics at Oxford in 1989. The 55-year-old, who was born in Rotterdam, has served as the chief economic spokesman and effective shadow finance minister for the Syriza-led government. One can easily see how a man like that would be preferred by the bankers and northern EU politicians. Almost like one of their own. So Varoufakis was a sacrificial lamb. It was the Greek PM’s message to the European lenders that he is ready to bend and genuflect to them despite the NO vote. And give them another man they could “negotiate” with. If Tsipras really intended to lead his country out of the eurozone, would he bending over backwards like this to appease the bankers? Tsipras’ comments in Brussels during the following days were also conciliatory even when he was being attacked by the northern Europeans. In the end, if Tsipras does go against the Greek popular vote and bows to the “carpetbaggers and scalawags” of Europe at the EU meeting on Sunday, he will have squandered the enormous political capital which he and his party had accumulated during the first five months in office. Will his countrymen accept defeat? That’s a big question. What is likely to follow in Greece is quite unpredictable. A prolonged agony, slow motion “Grecit?” A popular revolt? Coup d’etat? New elections? Who knows… None of it will be good for Greece. The volatile situation is not unlike that in Belgrade in March 1941. That’s when the Yugoslav government signed a neutrality pact with Hitler hoping to avert the war. It backfired. The deal lasted less than two days. 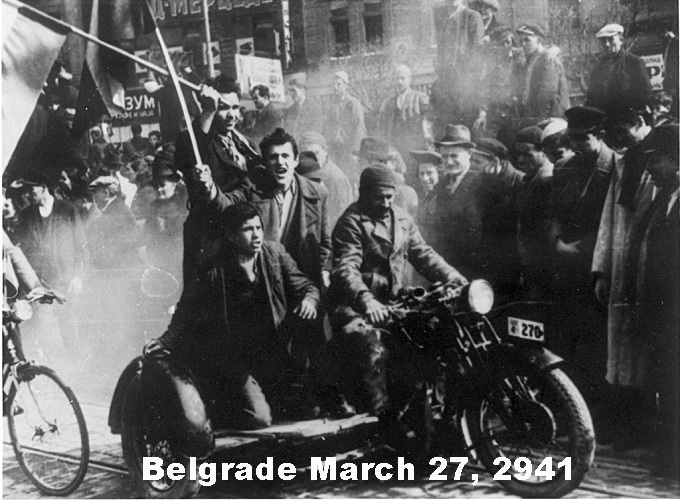 On March 27, 1941, the Yugoslav government was toppled after massive street demonstrations against the pact with Hitler (see ON THIS DAY IN HISTORY: “BOLJE RAT NEGO PAKT” (Better war than pact), MARCH 27, 2014). Ten days later, Hitler attacked Yugoslavia by bombing Belgrade on Easter Sunday without a declaration of war. So the appeasers got neither the peace nor power. The government had to flee the country, including the king. If Tsipras does lead his country out of the eurozone, however, then a new dawn for Greece and perhaps mankind may follow (see GREECE SAYS “OXI” (N€IN-NO) TO EURO/GLOBAL BANKSTERS… NOW WHAT?, July 5). That, however, is a less likely outcome on Sunday, unless they get booted out of the EU and have no choice but to leave. Either way, “we live in exciting times.” Which is a Chinese curse. This article had been written over a two-day period July 8-9. This morning, July 10, I learned of the new proposals by the Greek government which seem to acquiesce to the creditors demands for cutbacks and austerity measures which the Greeks had previously rejected (for details of Tsipras’ surrender, click here). This is a sad day for Greek democracy. Less five days after receiving a resounding “NO” vote in last Sunday’s referendum, the Tsipras government reversed itself and sold out the Greek people, especially the pensioners, into deeper usury and slavery. As you can see from this editorial, sadly, this is what this writer had been expecting. This is one of those occasions when all I can say is “wish I were wrong.” For the sake of Greece. For the sake of freedom in the world. In an unusual twist of events and synchronicity, at about the same time as Tsipras was betraying his people and caving in to the bankers’ demands, Pope Francis was urging the downtrodden to change the world economic order, denouncing a “new colonialism” by agencies that impose austerity programs and calling for the poor to have the “sacred rights” of labor, lodging and land (see Unbridled capitalism is the ‘dung of the devil’, says Pope Francis, July 10). In one of the longest, most passionate and sweeping speeches of his pontificate delivered in the city of Santa Cruz, Bolivia, the Pontiff also asked forgiveness for the sins committed by the Roman Catholic church in its treatment of native Americans during what he called the “so-called conquest of America”. What interesting times we live in, indeed! 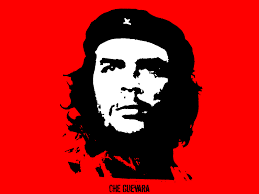 Who could have ever imagined that some day, we would see the Pope and Che Guevara on the same page of the political map of the world. You saw in my earlier comment an example of Divine Synchronicity between Pope Francis remarks and the Greek PM’s betrayal of his people. Also, that the Pope and Che Guevara, a famous revolutionary, are both Argentinians who now find themselves on the same political page. There was a third example of Divine Synchronicity. At the time I was writing my “Quo Vadis, Greece” editorial, which I finished last night, I did not even know that the Pope was in South America, much less what he would be saying the next day. 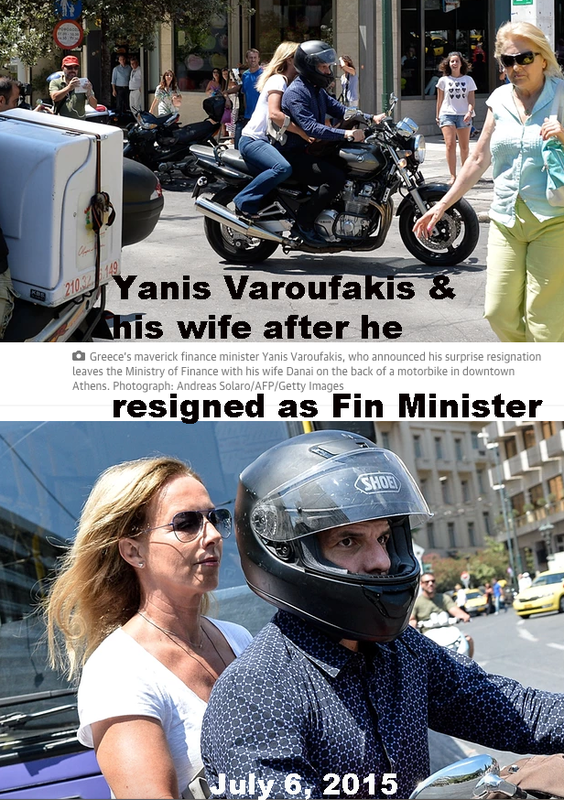 Yet in the part of the editorial dealing with Tsipras’ firing of his motorcycle-riding finance minister, Yanis Varoufakis, I made a reference to it being a page out of the “Greek Motorcycle Diaries” (a reference to the famous book and 2004 movie of the same title about the life of Che Guevara). 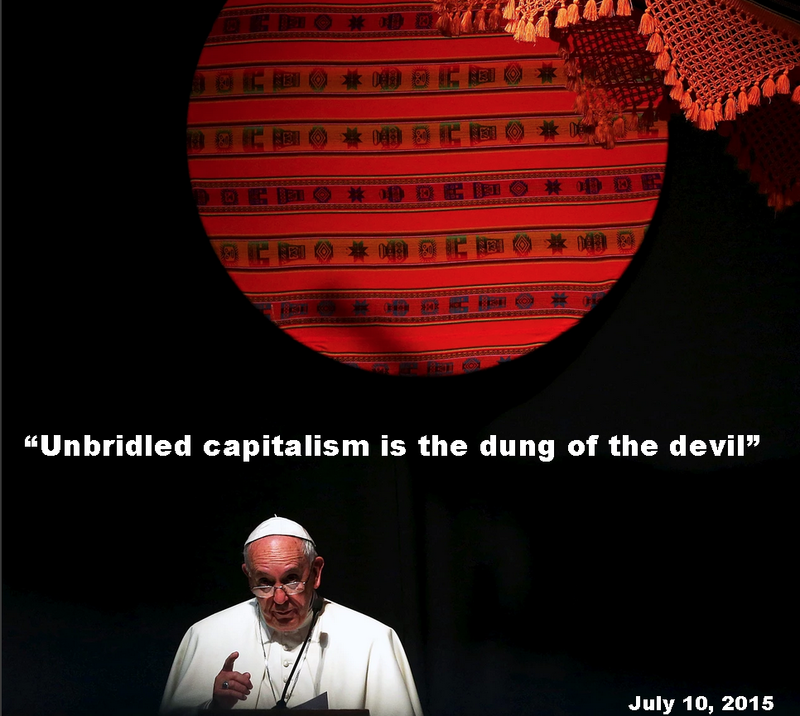 We are all slaves to the global banker’s usury (also see USURY AND TREATIES BASED ON HUMILIATION DON’T WORK, JUNE 13, 2015 ).